Tapjoy, whose app promotion campaigns have been halted by Apple in new and updated iOS apps, has come up with a new solution that it hopes can help it avoid Apple’s recent ban. The company has proposed a simple fix that allows Apple to identify app referrals from Tapjoy’s ad network so it can prevent those downloads from being counted by the App Store ranking algorithm. Tapjoy and other mobile advertising companies that promote incentivized installs were thrust into the spotlight in April when Apple began rejecting apps that included pay-per-install campaigns. The promotion allows an app developer to get paid when one of its app users downloads a separate app in exchange for virtual currency or some reward. The practice has drawn the attention of critics who said companies like Tapjoy were using it to game the rankings system by boosting apps in the top ranks. Apple didn’t publicly explain its actions but cited a section of the developer program license agreement that prohibits developers from manipulating user reviews or chart ranking in the App Store. Tapjoy CEO Mihir Shah said he reached out to Apple three weeks ago and offered to include a referral URL for the App Store when a user chooses to download an app in exchange for virtual goods. That would allow Apple to identify that the download came from Tapjoy and not count it in the App Store ranking algorithm. Shah said Apple wrote back a couple days later saying it had no time to discuss the issue. 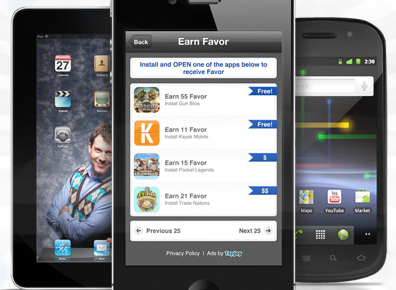 This follows another attempt Tapjoy made to limit the influence of its incentivized installs. Just days after the ban went into effect, Tapjoy also offered to limit pay-per-install campaigns to prevent any one app from leaping into the top 25 of the rankings through this form of cross promotion. Apple did not go for it. It’s left Shah confused about Apple’s stance on pay-per-install, which appeared to be about preserving the integrity of the app store rankings. What Shah believes is clear is that the Apple ban is hurting developers, who have relied on cost-per-install campaigns to help drive downloads and build awareness of their apps. A new survey of 496 iOS developers by Tapjoy underscores the impact of the ban with 48 percent of developers saying they’re received user complaints about the lack of incentivized installs and 54 percent of developers who say they’re making less money now because of the ban. Also, 60 percent of developers said they derived more than 20 percent of their revenues from pay-per-install campaigns. These results show how much many of Tapjoy’s developers came to rely on the pay-per-install model. I’m not sure developers should have been putting so many of their eggs in this basket. But Shah argues that the model has been good for up and coming developers, helping them get their apps noticed in the crowded App Store. With the cost of acquiring users about three times cheaper than more traditional display network campaigns, cost-per-install was an important tool for developers, said Shah. Larger publishers and bigger developers also used the model to help inject some predictability into their businesses. By leaning on pay-per-install, companies were able to justify their investment in mobile apps because they were able to better predict their performance. But Shah said the biggest impact is for users, often younger people and students, who were able to participate in games without access to a credit card by downloading another app. Shah said prior to Apple’s change, Tapjoy was interacting with 30 million daily active iOS users and 175 million monthly users on all mobile platforms, generating 1.5 million conversions a day. The company, like its iOS developers, has seen its business decline on iOS though it is making up for it with big growth on Android (s GOOG). Shah said he’s not clear why Apple still doesn’t want to work with Tapjoy and others even if they end their influence on the rankings. But he noted that Apple and others who operate mobile ad networks are benefiting from the enforcement change as developers turn to them for app cross promotion. I’m not sure Apple is trying to drive developers to iAd. There could be other reasons why Apple isn’t interested in implementing Shah’s solution. But he does raise some interesting questions about whether this ad model deserves a right to exist with limitions in place. Developers are struggling to get their apps noticed and have been using cross promotions display ads in apps. Cost-per-install is attractive because it’s cheaper and if Apple limits its influence on App Store rankings, is it so different from mobile display ads? Ouriel Ohayon, co-founder of AppsFire, an app discovery service which competes with Tapjoy, however, says the goal of developers should be to drive engagement, something Tapjoy hasn’t been able to prove. But Shah said cost-per-installs are more like coupons, helping users try an app. That’s a legitimate goal for developers, he said. The question appears to be moot on iOS for the time being because Apple is showing no willingness to change its ban. I have experience with Tapjoy aka Offerpal. They’re a shady company that rips off people legally. I personally am a PC/droid user, but I respect Apple in their decision. I wish it was one that the Android market shared. Incentivation isn’t ‘evil’ (even though my affiliate network won’t run incent offers). It just needs to be properly balanced as part of a broader marketing budget and correctly valued by all of the players. Incent = lower value users / lower engagement not only in Apps but on all forms incentivized media (web). That is OK again as long as it is valued properly. The issue is one of BALANCE. Developers should have never focused all of their marketing eggs on one marketing channel / basket (incentivized installs). This always leads to a “bubble” and there is always fall out from “bubbles”. In this case the fall out was Apple taking a hard line against incentivized CPI (Cost Per Install). If developers had a more balanced approach to their marketing the impact would have been lighter and Apple wouldn’t have reacted so strongly. But its not only the developers fault – it is the early stage venture capital and angel investors FAULT TOO! (I am an active angel investor including ARC Angel Fund, Hashable, Upnext). Investors were valuing developers based on the number of installs and their position on the App charts. Both of these were easily manipulated with incentivized CPI and the developers were rewarded by investors for this through both equity investments and higher valuations. * I am biased as the co-founder of Offermobi which has an NON-incentivized CPI (Cost Per Install) mobile network, but even I can acknowledge there will always be a place for incentivized offers, they just need to be properly valued by developers and part of a more balanced marketing mix. Good for Apple, and good for its users. Incentivized downloads are fundamentally dysfunctional, encouraging users to download apps for reasons that have nothing to do with the app in question. Nobody will miss it except app developers that weren’t able to compete on their own merits. (shaking head) When are developers going to start to realize that Apple is not worth developing for and they are just out to marginalize you and milk you of any and all profits ‘their’ public deigns to you throw your way. (shaking head) When are developers going to realise that crap is crap and no-one really likes incentivised installs? It’s not a bonus for the user, it’s just another nickel in the till for a developer and another crap app being pushed on people who don’t need it and wouldn’t want it under any normal circumstances. The app market is supposed to be about the user and exist for the benefit of the user, not the developer. I’m sure developers would like all kinds of things, that doesn’t mean they should get them, or that they are any benefit to the user.